M4A is an audio file extension which is developed by apple in the 2001. This format is fully compatible with the iTunes and iOS devices but it is not possible to play this audio file format in the other popular media players such as Windows Media Player and VLC Media Player. Another issue is that you can’t edit this format in editors like Audacity and Wavpad. If you are looking to play the M4A audio file in the popular media players, then you'll need M4A to WAV converter. Let’s learn about these converters in the following tutorial. When it comes to the M4A to WAV converter, KeepVid Video Converter is the highly advanced video converter program. This video converter is not like the other online and offline converter software where file size or number of conversion is limited. This software enables you to convert the files without any issue of limitations. This converter program is very easy to use so people don’t need to have any programming or tech knowledge to use it. Suppor to convert video and audio files without any limit. Convert video and audio files to more than 1,000 video and audio formats. Convert videos with 30X faster speed than any other converter. Convert HD videos up to 8K. Step 1. Start KeepVid Video Converter and add M4A file from your computer. Step 2. Select WAV as output, and click the Convert button to start converting M4A to WAV. Download and install KeepVid Video Converter on your computer, then start it. After that, click the Add Files button to add the M4A file, or drag and drop the videos into the program window directly. Locate “Convert all file to” label and click the inverted triangle next to it. Select Audio > WAV from the drop-down menu. After choosing the format, click the “Convert All” button to start converting M4A to WMA. •	WAV format can be played on many devices, but you may come up with issues when playing it on iOS device. • If you only need to convert one small file, you can use the online video converter. •	You can take advantage of the batch conversion feature to convert multiple files at one time. KeepVid Online Video Converter is very helpful online converter website with a powerful video converter web application. It supports video conversion of files online in the browser. 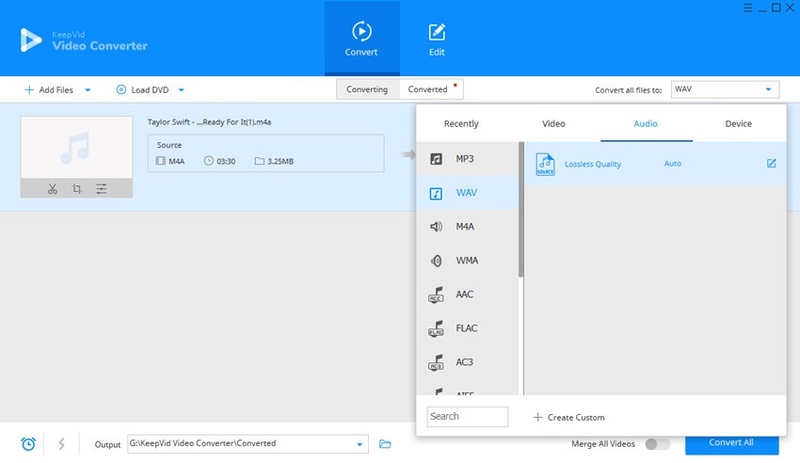 There is both audio and video conversion possible using this converter website and it also supports conversion of files by choosing the format as per your device name or OS. It fully supports 60 audio video file formats for the fast conversion. 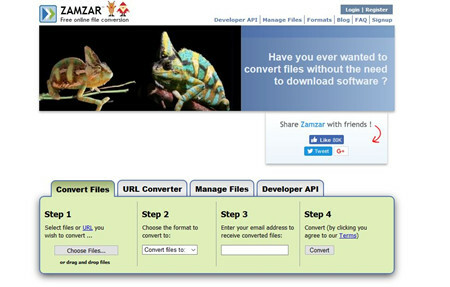 ZamZar is a free conversion website which also works online by uploading the files to the website function area. This website also allows you to convert the video and audio by entering the audio URL. This is also really very nice, easy to use and work without any need of software installation. There is an issue in this site that it is little bit slowly than the other converter websites. Windows Live Movie Maker is a part of the windows operating system. This is usually used to make movies but very few people know that it can also convert the files from one format to another one. The only issue is that it is not user friendly to convert files. To convert files using this software you have to load videos then do any changes in your files. At the time of saving choose different format to save. It's a program developed by Microsoft so it's reliable. Support to convert videos to play on different devices. Compatible with Windows XP to Windows 10 operating systems. 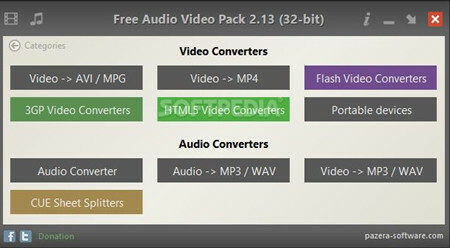 Free Audio Video Pack is free converter software for you. This converter program was previously available with the name Pazera Video Converters Suite. This software is consists of many different available video converter programs. This program is compatible with all versions of windows operating system. When you download this program it will be downloaded in 7z files which can opened using a free 7 Zip program. Convert videos to most of the popular video formats. This video converter has a good converting speed. Directly run the executable file from the zipped folder.